Thanksgiving is about tradition, and here at Capital Spice we’re thankful that our families have such strong and unique traditions surrounding the holiday. With our families’ traditions as a model, we decided to try our hands at a variation on a Thanksgiving dinner this weekend, calling it “Fakesgiving” and inviting some of our friends over to share the holiday-inspired meal. There’s lots to tell about the meal, but we thought the turkey warranted a post all its own. Our original plan was to buy a 16-pound turkey from the Organic Butcher of McLean, brine it for a day and then smoke it on the Big Green Egg, but the first bird they brought in for us weighed in at more than 24 pounds! We were overwhelmed by the prospect of that much turkey, and we knew there was no way we could fit a bird of that magnitude inside the Egg. Thankfully, the butchers said it would be no problem to order up another fresh bird for us the next day. As it turns out, the next turkey they received was almost 23 pounds – still a gigantic bird relative to what we were looking for. 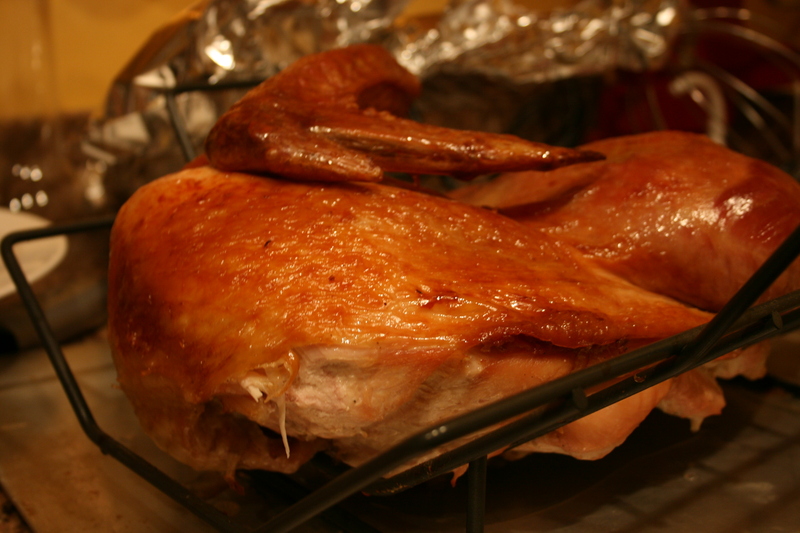 But time was no longer on our side, so we decided to take the bird in its entirety and then break it down at home. This would allow us to cook it more quickly, and it also permitted us to conduct a taste test (always fun) by cooking the same turkey two different ways. Smoking on the Big Green Egg (and a visit from the DC Fire Department), roasting in the oven, and a side-by-side comparison after the jump. Upon getting the turkey home, we settled it into a large cooler – its home for the next day or so. The bird was too big to fit into any of our pots, and we were intent on brining the turkey before cooking it, as our experiences with brined chicken have been uniformly spectacular. We prepared a brine based on a Chez Panisse recipe (2 1/2 gallons of water to 1 cup sugar and 1 1/2 cups kosher salt plus bay leaves, smashed garlic cloves, peppercorns, allspice and thyme), and poured it into a bag with the huge turkey. 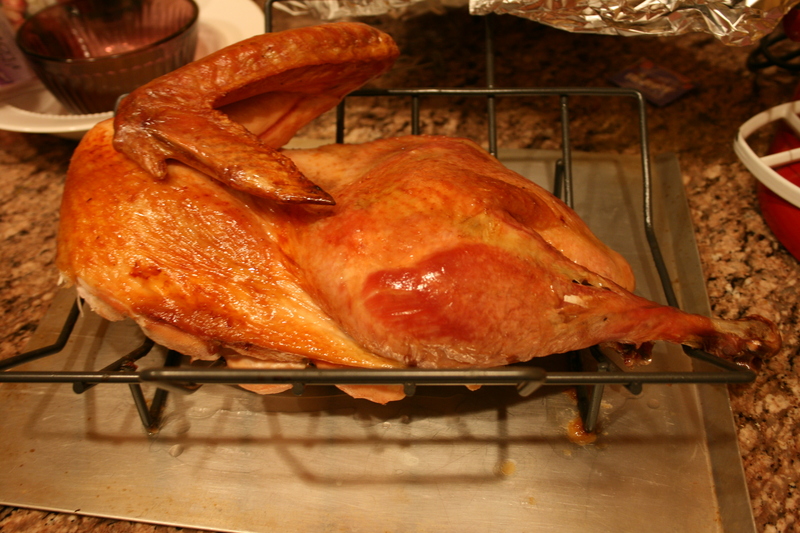 Once the bird was in the brine, it simply needed to sit (and stay cold, to prevent bacteria growth) for 24 hours. When ‘Go’ time arrived, we pulled the bird from the brine and split it down the middle as you would do to begin quartering a chicken. We ended up with two roughly equal halves, each with a breast, a wing, a thigh and a drumstick. One half would go onto the Big Green Egg to be smoked, and the other would go into the oven for a more traditional roasting. For the smoked turkey, we opted for a fire made primarily from hickory wood, hoping for a strong smoky flavor in the finished product. So there we were, at 8 in the morning, watching with approval as our hardwood charcoal and hickory wood produced thick plumes of white smoke and slowly approached the 250 degree mark at which the turkey would cook for the next 5 or 6 hours. Just as the cooker reached temperature, we heard approaching sirens – and quite a few, at that. It sounded like a pretty significant fire was underway somewhere relatively nearby. We ignored it and got the 11-pound half turkey situated on the Big Green Egg’s grill. With a plate setter arranged below the bird to disperse the fire, the turkey was less likely to burn or overcook in areas exposed to direct flames. Another quick check of the Egg’s thermostat, with a few adjustments to the vents at the top and the bottom, and we seemed to be holding steady at 250. But the sirens were also holding steady, and it became pretty clear that they were in the immediate vicinity. “Sounds like they’re here for the Big Green Egg,” Elizabeth said with a smile. I laughed at the thought of our cooking bringing out the fire department. Curious, we walked outside to survey the scene. What greeted us was unbelievable. 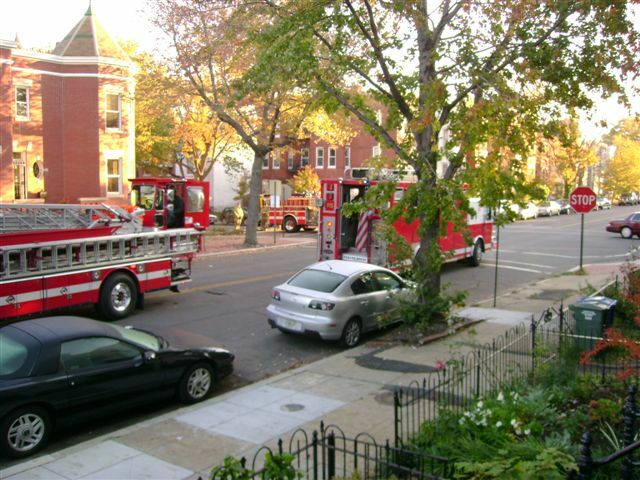 Five trucks, from at least four different fire houses from Northeast, Southeast and Northwest DC were parked in the nearby intersection. Men were unrolling hoses and preparing hookups to the nearest hydrants. And most of the firefighters were scanning the rows of nearby townhouses looking for signs of the blaze that had been called in. Taking everything in, we had the sinking feeling that Elizabeth’s joke had been spot-on. I approached the nearest firefighter and told him about our backyard smoker. He went to tell his captain, at which point we heard a voice crackle across the CB radios in each of the trucks “…SMOKING A TURKEY…” We led a small cadre of firemen into the backyard and showed them the source of the clouds of smoke that a neighbor apparently called in. Thanking them for their quick attention and apologizing for taking up their time, we watched all five trucks drive away and just burst out laughing at the absurdity of the situation. The turkey was to cook in the Egg for roughly 30-40 minutes per pound, so we expected it to be ready in about 5 and a half hours. Leaving our friend, Japanese steakhouse enthusiast Benny Hana, to monitor the temperature, we headed back to Capital Spice headquarters to attend to the rest of the meal (including the other half of the turkey). In the interest of making a true comparison, we opted not to do anything to the roasted half that we hadn’t done to the smoked half. We did not butter the skin, nor did we add any additional seasonings. We simply placed the chicken in a roasting pan and set the oven for 400 degrees. At that temperature, our bird would cook through in about two and a half hours. The roasting went off without a hitch. We opened the oven twice during cooking – both times to baste the turkey in a mixture of pan drippings and chicken stock. Two and a half hours later, the bird had a beautifully crispy skin, a juicy texture, and an intoxicating aroma. It certainly looked great! 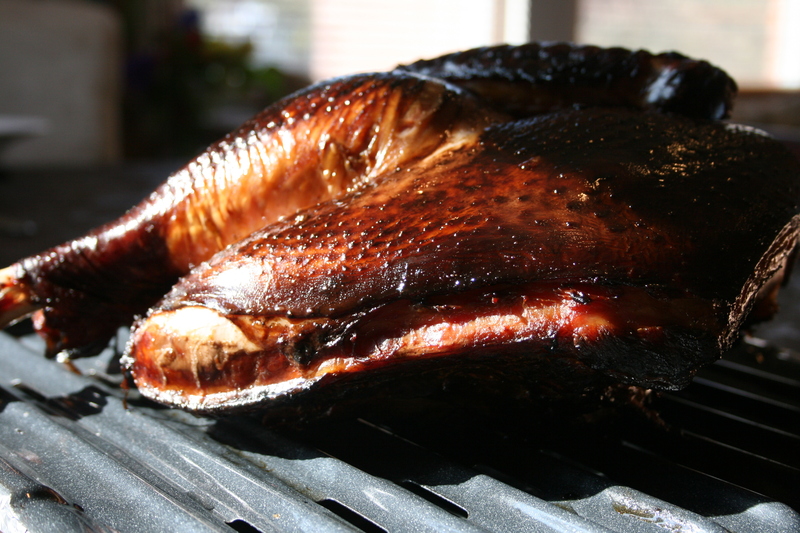 And how did the smoked turkey fare? 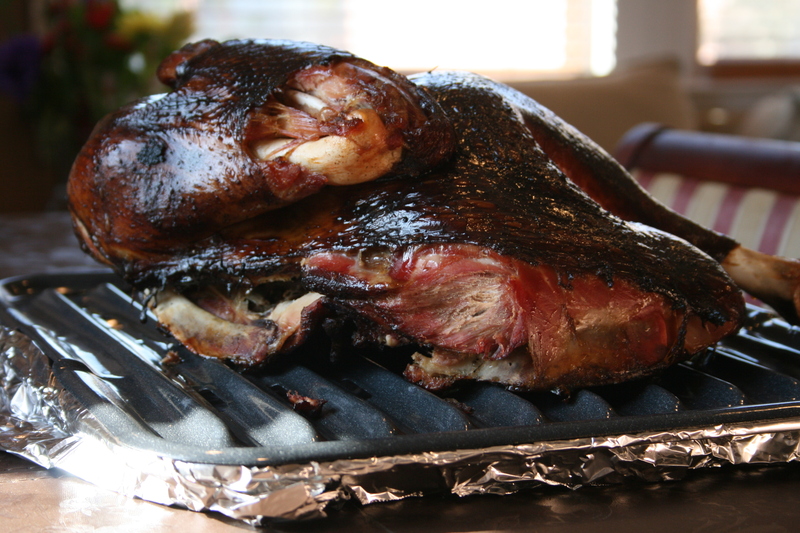 As expected, the smoke that had wreathed it for more than five hours made the bird look like a Peking duck hanging in a window – dark, lacquered-looking skin with a healthy smoke ring of pink below the surface, a light sizzle, and a moisture content that was through the roof (when I removed the temperature probe, it was followed by a veritable fountain of juice from within the breast). The scent was that of cooking bacon; we were in heaven. 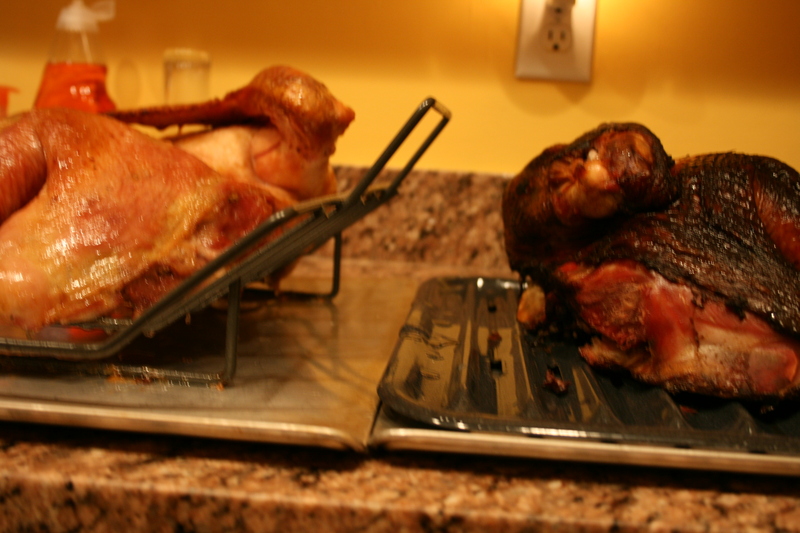 Both halves were given at least 30 minutes tented in aluminum foil to rest after cooking, to allow the juices within the bird to redistribute. We then set them up side by side, and served some of each to everyone. It was really interesting to see the comparison. The oven-roasted half definitely retained more moisture than the smoked half, despite the gusher of liquid I struck when testing the temperature of the smoked turkey. Both had a lightly salted flavor, but the brine was not overpowering in either. And both seemed to take to the spicy gravy we served with them equally well. 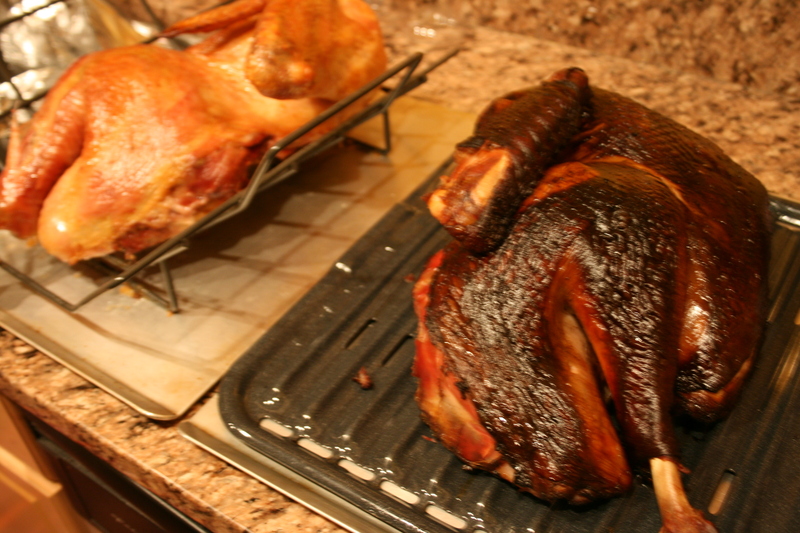 The greatest difference was in the depth of the flavor imparted to the turkey through the smoking process. The taste filled your mouth with a warmth and a hickory-tinged bite that seemed to be bigger than the turkey itself. Both presentations were well received, but among those who had a favorite around the table the smoked turkey was definitely the winner. Even though we’re still not going to be celebrating Thanksgiving dinner at home for a while, we definitely intend to pick up another turkey or two so we can try smoking again. 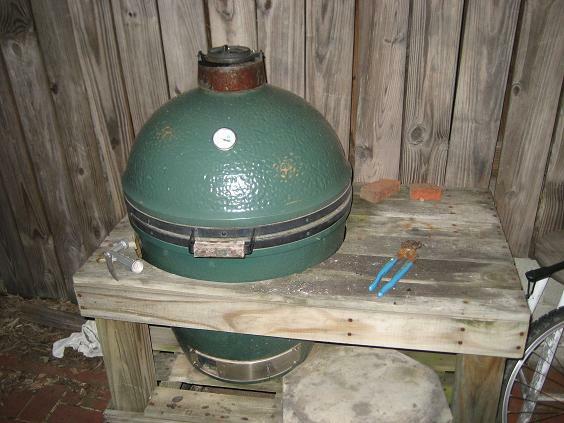 I’ve used a Big Green Egg for years, and we enjoy taking smoked turkeys to friends for the holidays. The best luck I’ve had for turkey is using the Egg at 350 to 400 degrees. A 26 lb turkey in the large egg will roast in 2 1/2 to 3 hours. (Yes, it will fit in the large egg. I called the company in Atlanta and spoke to the vice-president before I purchased my Egg! Wonder what would fit in the new ex-large egg.) It comes out moister than lower temps, and still has the wonderful smoked flavor. Cooked to an internal temp of 170 degrees, the meat will be slightly pink, but don’t be fooled — it is done! My thought is that the higher temperature seals the bird, and retains more of the juices. I have a secret incredient for your basic GB casserole. Garam Masala. It brings a taste and warmth that folks don’t expect and is perfect. Nothing more than the Cambell soup recipe but about 1-2 teaspoons of GM. LOVE this idea, Bill. Thanks! Thank you! I am going to do this for my Thanksgiving meal and really need to read what others had done first! I appreciate it greatly~ also if you have any additional tips, I would be most grateful!